Flight hardware for the inaugural launch of Falcon 9 rocket undergoing final integration in the hangar at SpaceX's Cape Canaveral launch site in Florida. Components include: Dragon spacecraft qualification unit (left), second stage with Merlin Vacuum engine (center), first stage with nine Merlin 1C engines (right). Thepieces are coming together for a new commercial rocket envisioned to sendunmanned cargo ships to the International Space Station from a launch site inFlorida. Builtby Space Exploration Technologies (SpaceX) of Hawthorne, Calif., the new Falcon9 rocket is a two-stage booster designed to launch the company's Dragonspacecraft to orbit. It is the lynchpin rocket behind SpaceX's plan to launch cargo ships to the spacestation under a $1.6 billion contract with NASA. 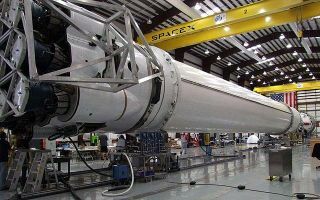 Therocket is being assembled in Cape Canaveral, Fla., and SpaceX plans to launchthe Falcon 9 on its maiden flight later this year from the Cape Canaveral AirForce Station. Thefinal delivery of Falcon 9 parts included the rocket's second stage, whichsuccessfully completed a full-durationtest firing at the company's proving grounds in Texas in January. The testwas the last hurdle for the upcoming demonstration launch. "Weexpect to launch in one to three months after completing full vehicleintegration," said Brian Mosdell, Director ofFlorida Launch Operations for SpaceX, in a Thursday update. "Our primaryobjective is a successful first launch and we are taking whatever timenecessary to work through the data to our satisfaction before movingforward." SpaceXis one of two companies contracted by NASA to provide commercial cargoshipments to the International Space Station. OrbitalSciences, Corp., of Virginia, is building its own Cygnus vehicles and Taurus 2rockets under a separate contract. Both companies had received seed money fromNASA under its Commercial Orbital Transportation System (COTS) program aimed atspurring development of privately developed spacecraft. Underthe NASA?snew space plan, which nixed the Constellation program building its nextgeneration spaceships to send astronauts back to the moon, commercialspacecraft will receive more attention as the best option for future humanspaceflight. The agency?s 2011 budget request includes setting aside $6 billionover the next five years to spur commercial spacecraft development. Earlierthis month, NASA also doled out a total $50 million in awards to supportthe commercial spaceflight efforts of five other American companies, notincluding SpaceX and Orbital Sciences. Followingfull vehicle integration, SpaceX will conduct a static firing to demonstrateflight readiness and confirm operation of ground control systems in preparationfor actual launch. TheFalcon 9 rocket stands 180 feet (55 meters) tall and is the launch vehicledeveloped by SpaceX. The first, the smaller Falcon 1, made its first successfullaunch in 2008 and delivered its first commercial payload ? a Malaysiancommunication satellite ? into orbit last year.